Daughter of Hyrcanus II., and wife of Alexander, son of Aristobulus II. She was one of the strongest and shrewdest supporters of the Hasmoneans at the court of Herod. When Hyrcanus was humiliated by Herod, on the occasion of the latter's entry into Jerusalem, Alexandra sought to stay the destruction of her father's house bybetrothing her daughter Mariamne to the Idumean conqueror. And when Herod, as king of Judea, appointed to the high-priesthood the obscure Ḥananel, she protested publicly against this injustice, and claimed the post for her young son Aristobulus. Upon the advice of Delius, the friend of Antony, who had assured her that nothing would be refused to the mother of two such pretty children, Alexandra even sent the pictures of Aristobulus and Mariamne to Antony and Cleopatra, begging them to aid her in obtaining her rights. Herod must have realized that he had committed a grave error; for, upon learning of the step Alexandra had taken, he installed the sixteen-year-old Aristobulus in the high-priesthood (B.C. 35), stating that his reason for not having done so in the first place was the extreme youth of his brother-in-law. But he publicly charged Alexandra with conspiracy against him; and it was only through her consummate hypocrisy that she extricated herself from the inculpation. 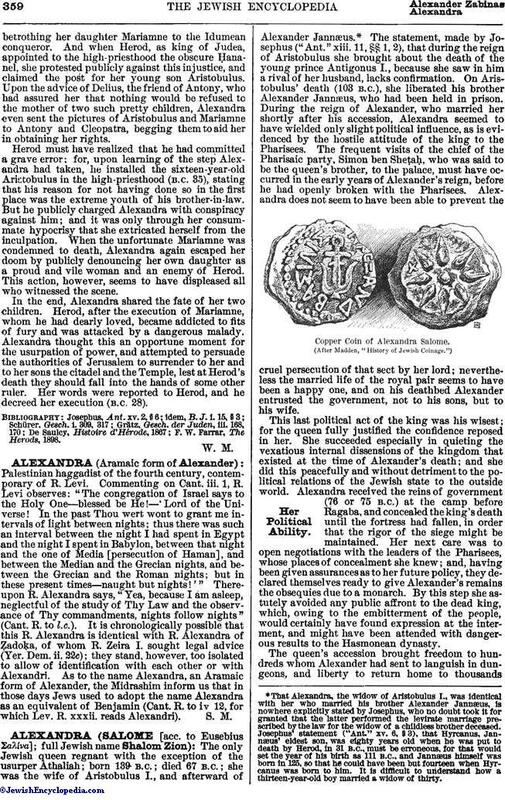 When the unfortunate Mariamne was condemned to death, Alexandra again escaped her doom by publicly denouncing her own daughter as a proud and vile woman and an enemy of Herod. This action, however, seems to have displeased all who witnessed the scene. In the end, Alexandra shared the fate of her two children. Herod, after the execution of Mariamne, whom he had dearly loved, became addicted to fits of fury and was attacked by a dangerous malady. 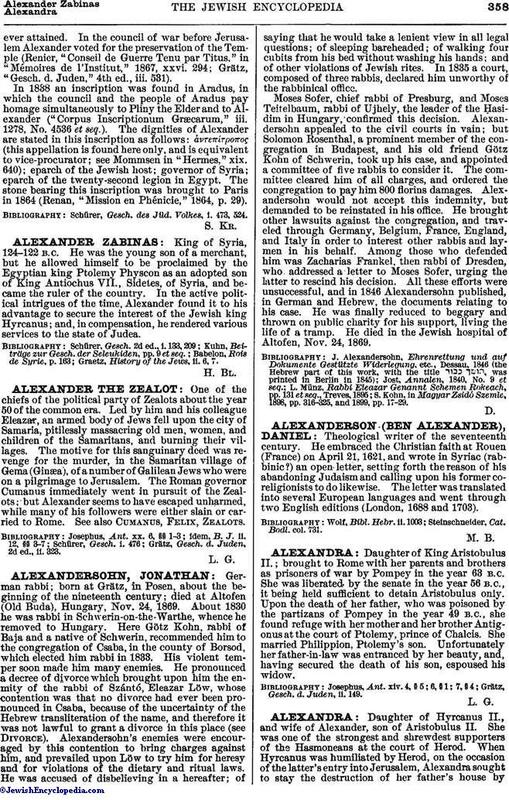 Alexandra thought this an opportune moment for the usurpation of power, and attempted to persuade the authorities of Jerusalem to surrender to her and to her sons the citadel and the Temple, lest at Herod's death they should fall into the hands of some other ruler. Her words were reported to Herod, and he decreed her execution (B.C. 28). F. W. Farrar, The Herods, 1898.